Does Marvel Cinematic Universe Include X-Men & Fantastic Four Alongside Avengers & More? Marvel Studios Head Kevin Feige Comments! Will Marvel Cinematic Universe Now Include The X-Men and Fantastic Four Alongside The Avengers and More? Marvel Studios Head Kevin Feige Comments! 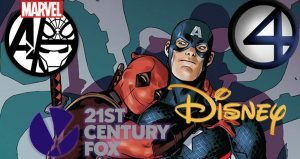 Vulture spoke with Feige during the Black Panther movie junket about the blockbuster Disney and Fox deal; Disney also owns Marvel. His comments on response to the X-Men entering the MCU are below. The truth of the matter as I understand it is the deal has to be figured out. There’s been no communication. We’re not thinking about it. We’re focusing on everything we’ve already announced. If and when the deal actually happens, we’ll start to think more about it. Until then, we have a lot to do. It would be years away. We’ve announced everything through 2019, so none of those would be adjusted. So, the Disney and Fox deal doesn’t seem done yet and when it does get done, if it does, then we won’t see the X-Men in the MCU for a few years. Marvel Comics Universe & Avengers #18 Spoilers: Squadron Supreme Of America & Agent Phil Coulson Pulled Into War Of The Realms! Are They Friend Or Foe? Preview!